Ambassador Leonidas Chrysanthopoulos apparently caused quite a stir on Thursday when he told a diplomatic newspaper in Canada that the Greek government has commissioned "Blackwater" (or Academi) -a powerful mercenary army- to provide military security to the Greek Parliament! He said that some these members have engaged in activities in shadow operations in areas such as Iraq, Afghanistan while others say that they are they see themselves as being above the law! In fact a report on the YoungTurks said that they have been brought up on international war crimes in Iraq! The report was confirmed on February 1, 2013, when the Greek military news site Defencenet, citing the same Canadian newspaper sources. According to Defencenet, the contract is alleged to have been signed by former Parliament President Evangelos Meimarakis. Obviously this new, and shocking revelation, raises many concerns about the safety of Greek citizens and the violation of the fundamental principles outlined in the Greek Constitution. If the information is true, because there are still many doubts about this story, then the government is accountable and whoever is involved with this, must immediately resign and be brought to justice. 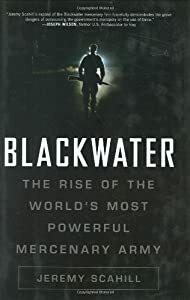 Blackwater or "Academi" - previously known as Xe Services LLC, Blackwater USA and Blackwater Worldwide- is a private military company founded in 1997 by Erik Prince and Al Clark, a right winger who apparently was a great fan of the Bush family (according to Jeremy Scahill who apparently exposes this mercenary force in the video above). The news itself is SHOCKING, and as we said earlier, the Greek people deserve answers! Here is the statement from the Greek Ambassador in Canada that has caused such a stir in Greece, as posted on the Greek-Salonika news site. For argument's sake let us suppose it is true. Maybe the government does not feel secure from the present Greek police force because let's face it, these young men and women are being paid peanuts for maintaining law and order and after the latest wage cuts their wages have been reduced to ridiculous levels. On the other, maybe there is some other kind of threat, and something that citizens do not know about. Prime Minister Antonis Samaras had mentioned this months ago, and we all know what types of threats have been flying our way from ultra nationalist groups in Albania, as well as Turkey.Also, Greece is getting ready to proclaim its EEZ so maybe these forces are here as part of some strategy. On the other, maybe, the Greek government commissioned these forces to train its own specialized police force to face a possible threat. Or maybe, just maybe these forces are here to weed out the bad guys that are associated with the recent bombings in Athens. Moreover, in several cases of narcotics contraband in Greece where Albanian smugglers were involved, links were established as for the ulterior motive of the smuggling which included raising capital for extremist purposes. In similar fashion, a leading Greek journalist and security expert, Manos Eliades has showcased in a recent book of his, links and case studies of direct cooperation between certain Albanian immigrants to Greece and the Turkish intelligence service MIT. For the time being it has been established that UCC (according to Research Terrorism Center in Washington, UCC is a known terrorist group), although still in nascent form, is being kept as a potential destabilizer regarding Greece and it is being supplied with weaponry from the Albanian black market. There is also support from radical Albanian-American groups and the Turkish intelligence service and the focus has been shifted from propaganda purposes into recruiting Albanian immigrants in Greece by using as a pretext the economic distress many of those have felt due to the ongoing economic crisis in the country and the lack of employment opportunities. Lastly small-scale paramilitary training is taking place in Northern Albanian and UCC serves yet another role -this time regarding domestic Albanian politics- by having the ambition of be seen in the South of the country as the “Long arm of the Kosovo Albanians”, which do keep their aims of uniting the rest of Albania with Kosovo and not vice-versa. The countermeasures implemented so far by the Greek state include a variety of intelligence and security actions. One of those that is on an training level and it is going to be fully operation by the end of 2012, is the creation of rapid and heavily armed Police mobilization units to intervene in cases both of heavy criminality (armed robberies with the use of AK-47) and any potential paramilitary actions, as the hypothetical threat by UCC. So maybe, just maybe the Blackwater team is here to train Greek officials instead. At least we hope this is the reason. If not then we must know the ugly truth. This must be cleared up immediately.